It’s no small secret that I love my Kindle Paperwhite. It’s pretty much the perfect device for reading books both large and small. I know many people like using their phones or tablets for reading, but I always found the apps and notifications on those devices too distracting when I wanted to read. A new email or message from Facebook is the last thing I need popping up when I’m face-deep in a novel. Plus, I can’t really justify bringing a tablet over my Kindle when traveling, especially since (1) my phone can do many of the same tasks, (2) the battery life of a tablet pales in comparison to a Kindle, and (3) I really don’t personally enjoy the experience of reading on LCD screens compared to e-Ink. However, that doesn’t mean that Amazon’s reading devices are flawless creations sent down from on high. The company recently announced their latest and greatest Kindle – the Kindle Oasis – and to be honest the device rather underwhelming. It’s been three and a half years since I bought the first Kindle Paperwhite, and it’s a little puzzling that the only improvements to Amazon’s e-reader is a slightly better backlight and a fancy battery case. The Oasis is certainly a nice looking e-reader, I can’t help but wish for something even better. What if Amazon made the Kindle the ultimate reading device, no matter what kind of content you were reading? 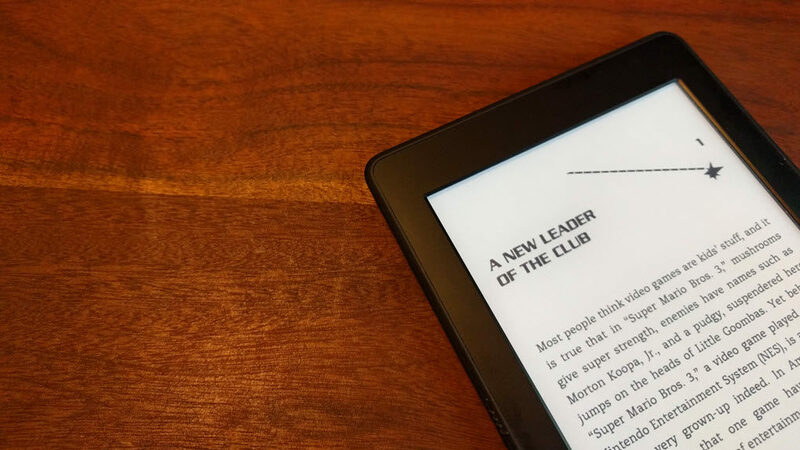 The very first Kindle e-reader was released nearly nine years ago, and during that time, we’ve seen many features come and go. There were Kindles with and without keyboards; some have touch screens and others have page-turn buttons; at least one version had a home button; the screens now have a higher resolution and a built-in backlight; and one Kindle had a giant screen designed for reading newspapers and textbooks. But through all its iterations, the one aspect that hasn’t changed on the Kindle is the black and white e-Ink screen. Perhaps it’s time for Amazon to rethink that as well. I know that a colored-screen Kindle is hardly an original idea. It has been on the wishlist of every Kindle fan for years. And despite occasionally hearing about some new breakthrough with the technology, color e-Ink never seems to reach the venerable e-reader. “Why do you even need a color display?” I hear some of you asking. “Aren’t most books just black text on white paper?” It’s true that most novels and non-fiction books aren’t affected by the black-and-white limitation of current e-Ink displays. Even Japanese manga – much to my delight – looks beautiful on the monochromatic Kindle screen. Western comic books, however, were designed with color firmly in mind. In 2014, Amazon bought Comixology – which I believe is the largest distributor of digital comic books – so this seems lie a market they are interested in long-term. With a full-color display, Amazon could create not simply the next great reading device but the digital comic book reader many nerds – myself included – have been dreaming of. Amazon could let the Kindle run apps. Allowing users to download apps (both 1st- and 3rd-party) would extend the Kindle’s core functionality beyond just reading ebooks. In effect, it would become the ultimate reading device. If you’re a nerd like me, you could download a Comixology app and read through your digital comic book collection. If you save online articles to read later, you could download a Pocket or Instapaper app. And let’s not forget about Audible: Amazon’s audiobook service. There are so many reading-focused apps and services that could easily plug into the Kindle if given the opportunity. The key, however, will be keeping the app selection limited. The last thing I need is email or Facebook distracting me from the latest Song of Ice and Fire novel. On the more mundane side of things, these new features will require big bump in storage capacity. According to Wikipedia, my 1st Gen Paperwhite has a paltry 1.25 GB of storage available. Comixology files are substantially larger than the average ebook, and once you add audiobooks into that mixture, that itty-bitty hard drive is woefully insufficient. I’d say a 16GB hard drive is the absolute minimum required. I don’t know about the rest of you, but my apartment is filled with devices that constantly need charging: two different computers, a smartphone, a Nintendo 3DS, a Pebble smartwatch, wireless headphones, and a Kindle (among others I’m certainly forgetting). The never-ending cycle of plugging and unplugging cords, buying more and more elaborate power strips… Oh, what I wouldn’t give to obviate the need to charge at least one of my gadgets! How is it that 20 years ago solar-powered calculators and watches were commonplace, but today no mainstream company is using the technology for consumer electronics? After all, solar power technology seems to get better with each passing day – the panels get increasingly thinner, the efficiency goes up, and some solar panels can even be transparent. Even if you couldn’t use it on power-hungry devices like smartphones or tablets, the Kindle, with its low energy needs, seems like the perfect candidate for solar-powered charging. Whether that power is generated through a fancy case (similar to the battery case for the Kindle Oasis) or through something more radical like transparent solar panels, this is something Amazon should definitely be working on. Years ago, I envisioned how Amazon could fix the Kindle Fire, and for the most part all my predictions came to pass. Reading it now, however, I realize that those ideas were the lowest of hanging fruit. By comparison, my proposals for “fixing” Amazon’s flagship reading device are hardly small tasks. Each requires substantial (maybe even radical) changes to the Kindle’s fundamental hardware or software design, some of which may not even be technologically possible at this time. Or maybe… it’s just around the corner.